Sharai Campbell and Alecia Newsome are an unlikely pair, and that may be the source of their effortless magic. Campbell had an idea six months ago, and that was all Newsome needed to hear to push her to execute it. Now, a quiet revolution – with a peculiar feminine flavour, is seeping across the West, and when it’s all said and done, for women and young girls, glass ceilings will be shattered, and barriers will be broken, thanks to the now rapidly expanding movement founded by the two women – ‘Peonies and Intellect’. Peonies and Intellect is a women-only initiative geared at providing a constant flow of access, resources and practical information to women and young girls across Western Jamaica, to help in their journey of success and self-actualization. Each month, at a specific location, the society’s members meet, socialize, and empower each other through seminars, presentations, mentorship and charitable initiatives, all in an effort to expose its members and to increase their connectivity across various sectors in the working world, as well as in personal endeavours. “Well, we realized for some time now, particularly between women in the workplace, that there was more competition than collaboration, and we wanted to change that. There is enough for us all to succeed, and so the two of us got together, and decided to be the change we wanted to see. Essentially, we wanted to have a tribe of women – a network – helping each other on their individual journeys to success,” explained Campbell, the founder of Peonies and Intellect. The name ‘Peonies an Intellect’ may seem odd at first, but its symbolism is quite apt for what the inspired women are trying to accomplish. “Peonies signify prosperity, good fortune, honour, and compassion, and that’s exactly what our organization – our movement, is about. The intelligence part of it is pretty much self-explanatory. We want to foster the kind of environment, not just among ourselves, but in the lives of the women who are a part of us, where they can thrive, and know that there is a whole network behind them pushing them in practical ways to achieve whatever they feel would make them successful,” Campbell explained. In an organic way, the women of Western Jamaica saw the vision of Peonies and Intellect, and in a powerful way, they responded. In their first meeting, which was expected to have at most, 10 people, that number tripled. Then doubled. Even more, the movement, supported by women from all walks of the professional spectrum – lawyers, doctors, investment bankers, among others, has begun to take on a defined structure far earlier than was intended by the founders. But, they are embracing this. Why only women though? The answer, for the founders, at least, was simple: men have long since established networks of support, especially for career-building and personal development purposes, and it was high time women in Western Jamaica had the same. “We are not saying women weren’t helping other women in Western Jamaica before we started Peonies and Intellect; rather, we’re saying we acknowledge those efforts, and want to do those things on a much bigger scale,” Campbell pointed out. “There was also the issue of wanting to find people we could relate to. As a professional and as millennials, it’s hard to juggle our many responsibilities, which we knew other women could relate to, so for me, having this network served as a space to really see how they have been handling those challenges, and to help each other along the way,” Newsome added. What’s unique about the idea brought forward by Campbell and Newsom is that while a big part of it focused on having the usual presentations geared at inspiring the women to make a change, their true actions went far beyond that. “Sure, hearing the inspiring speech is good, but a week from now, a month from now, when the inspiration wears off, what then? We don’t believe that your network is only supposed to be there when you have these meetings. We believe that your network should be a real thing that benefits you in the real world.” Campbell further disclosed that it is for that reason why a number of initiatives are being rolled out in the coming months, all geared at providing practical ways for women to achieve success. Sharai Campbell and Alecia Newsome only wanted to bridge the divide between women in the workplace, but now, they are doing so much more. Peonies and Intellect is a movement Western Jamaica never quite knew it needed, but it’s here, and it’s flourishing, and it’s getting bigger. The two women are doing their part to foster productive competition, and with an army of like-minded women walking beside them, they’ll accomplish much more than that. “The two most important days in your life are the day you are born and the day you find out why.” —Mark Twain. 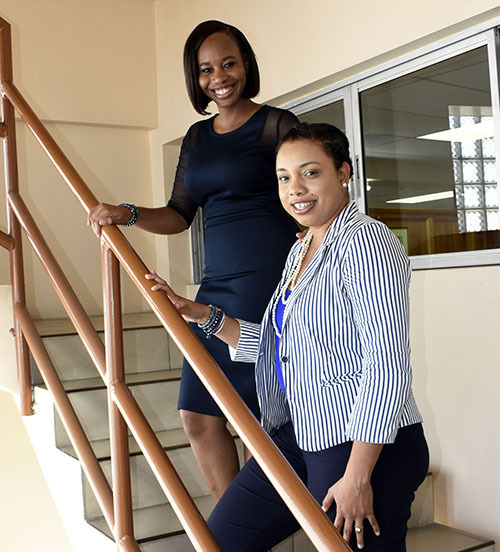 It seems Campbell and Newsome have figured out their ‘Why’s’, and so has the growing number of women from Western Jamaica walking with them.